We meet on the third Monday of each month at 7.30 pm either at Primrose Hill Community Centre (usually) or at Sidings Community Centre , West Hampstead (occasionally). Our AGM is in May and annual party in December. In other months we either have a speaker or we discuss whatever people are interested in, e.g. new and current campaigns. Kentish Town Bike Workshop is held on the first Monday of each month at Bartholomew Road Health Centre. Cycle training sessions are organised a few times a year at Sidings Community Centre, West Hampstead. We have four meetings a year with a group of Camden Officers to discuss the development of the cycle routes throughout the borough, how cycling issues can be incorporated into local area schemes and how well they are addressed in built schemes. Julian Fulbrook (Camden’s Councillor Cycling Champion since summer 2015) and Paul Braithwaite ( 2006-10 and 10-14) has been a useful participant in these meetings. Many ad-hoc meetings are arranged to discuss projects in detail (e.g. Tavistock Place trial, N-S Superhighway, Delancey-Pratt, Midland Road, Holborn area schemes, West End Project). We also have occasional meetings with TfL officers (e.g. on Swiss Cottage gyratory and the Tottenham hale – Camden cycle route). We participate in the Royal Parks Cycling Development Group. We hold two regular events in Bike Week, a national event which usually takes place in June. On Wednesday morning from 8-10 a.m. we provide a Free Cyclists’ Breakfast in Ossulston Street, run jointly with Camden Council (the 2018 event was the 21st in succession). The Ride all Round Camden for 2017 was on Sunday 19th June. It was led by John Chamberlain, marshalled by Camden Cyclists and Camden Cycle Trainers and accompanied by police officers. The route starts from the Town Hall, follows the border of the borough clockwise with a picnic in Golders Hill Park. This year was the 11th event in succession. In 2018 we decided to give the Ride All Round a rest and John led us and our friends from Cycle Islington to Lee Valley instead. During summer months we organise a ride each month. These usually include the popular Lee Valley Ride and a train-assisted ride in Herts, Kent or Essex as well as the newer Brent Parks Ride and the Ice Cream Potter. We also lead feeder rides from Swiss Cottage and West Hampstead to the summer Ride London Circuit. We have led feeder rides to two campaigning rides organised by LCC: the Space for Cycling protest ride in September 2013 and the Space for Cycling Big Ride in May 2014. In addition we have ‘inspection rides’ the most recent of which was led by Steven Edwards in the Gospel Oak area. The new Royal College Street scheme: opened August 2013, won an award from LTA, a cycle counter installed in April 2014 shows over 100% increase in cycles since before installation. The Royal College Street scheme southern extension with stepped tracks was completed in summer 2015 with another cycle counter. The northern extension opened in June 2016. So now we have a continuous cycle route from Kentish Town Road to Midland Road. The Tavistock Place trial has been in place since December 2015. It won an LCC award in summer 2016. A consultation on making it permanent took place in September 2016. Although the result was very much in favour, there was a Public Inquiry in October 2017. The trial layout was made permanent in November 2017. This was followed by a consultation as to whether to retain eastbound motor traffic. The Judd- Midland route started construction in January 2019. Camden’s Draft Transport Strategy 2019 -41 includes a Cycling Action Plan and a borough-wide cycle network. We had very bad news on CS11 in February 2019. The consultation on Delancey- Pratt was agreed in 2015 but implementation has been delayed for another consultation on the Parkway junctions. 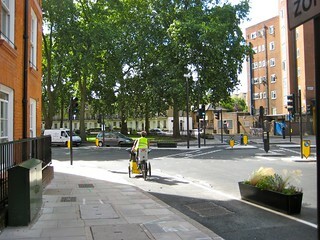 Clerkenwell Boulevard: Launched summer 2013; considered within the Holborn area study; LCC’s main campaign in 2017 is to be ‘London Boulevard” – a route from Old Street to Tottenham Court Road.